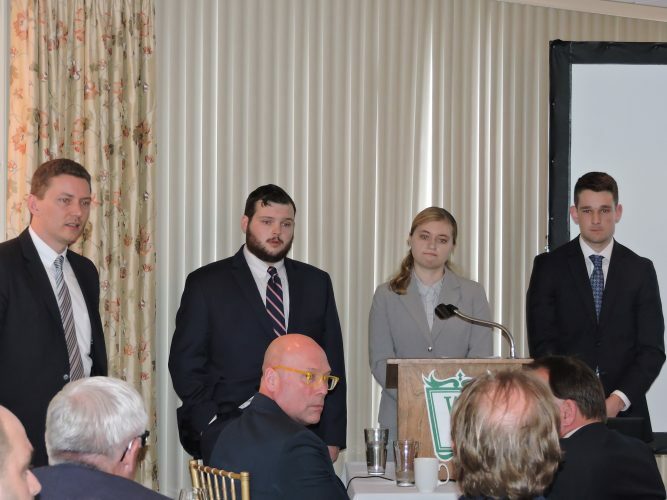 MEDICAL MARIJUANA FOCUS FOR ROTARY — Mike Petrella, local businessman and the owner and CEO of the Ohio Valley Natural Relief LLC medical marijuana dispensary, spoke to members of the Steubenville Rotary Club Friday about his new business and the laws and regulations surrounding the venture. The dispensary, located at 840 Canton Road, Wintersville, was set to open on Sept. 8, but has been delayed, due to the Ohio Medical Marijuana Control Program not being able to meet deadlines. 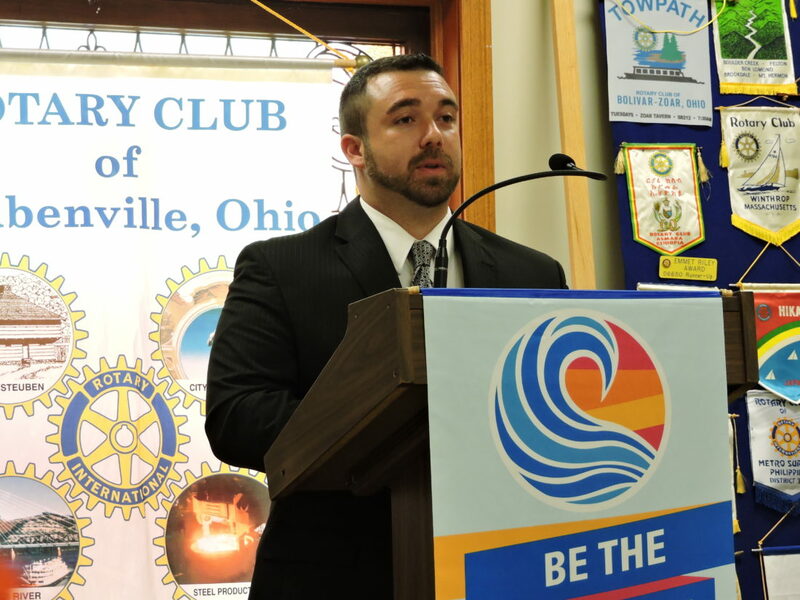 STEUBENVILLE — Mike Petrella, owner and CEO of Ohio Valley Natural Relief LLC medical marijuana dispensary located at 840 Canton Road, Wintersville, spoke to members of the Steubenville Rotary Club about his new business venture and why it is a personal mission for him. “We were on vacation when my father, Craig, was diagnosed with Stage 4 lung cancer that had metastasized,” he said while speaking during Friday’s luncheon meeting at the YWCA. He went on to tell the group how his father was allergic to most narcotics and suffered severe side effects from the others. Watching his father suffer inspired Petrella, who already was interested in medical marijuana, to begin seriously looking into the business. The same year his father died, the state passed the law allowing Ohio to enter into the industry. The state is broken up into districts, with Jefferson County being located in Southeast Region 9 along with Harrison, Belmont and Monroe counties. The only dispensaries to be awarded were in Wintersville. The second dispensary is owned by Chicago-based Cresco Labs Ohio LLC and will be located at 180 Main St.
Petrella said he hopes to clear up any confusion on the dispensaries — especially regarding security. Petrella also spoke about what it will take to work in his store. In order to enter the store, a person must have a prescription card issued by the state of Ohio. Cards can only be issued if someone has been seen and referred by a specially licensed doctor who has been trained by the state. Cards are only available to Ohio residents, who must provide a state-issued identification card as well as a second proof of address. Petrella discussed the opioid problem in the state, especially in Jefferson County, and how this may be an answer for many. The original operation date for the opening of the dispensaries was to be Sept. 8, but the Ohio Medical Marijuana Control Program has pushed that back indefinitely. The reasoning being given is that the cultivators in the state do not have any product available yet. In order to be sold in Ohio, the product must be grown here. Petrella also explained that medical marijuana is not covered by insurance. It will be a cash-only business mainly, with a few dispensaries able to accept debit cards. He said that at this time he cannot give an idea of prices involved. Petrella reminded everyone the dispensaries still will be operating in a gray area under the law. While Ohio law will allow the substance to be used for medicinal purposes, the use, production and distribution of marijuana is prohibited under federal law. “The federal government can still shut it down and possibly even arrest me if they wanted to,” he said.